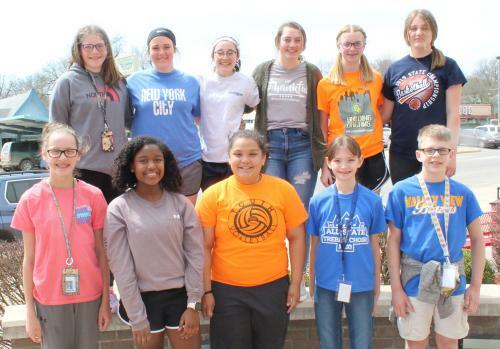 With just one year of experience behind them, Royster Middle School students vaulted out of the district FCCLA competition this spring and will send nearly everyone who competed to state next week. “This year I had 12 compete at district and 11 qualify for state,” said Family and Consumer Science (FACS) teacher and FCCLA (Family, Career and Community Leaders of America) sponsor Sheila Foster-Ruckle. That’s quite an improvement over last year when three out of six students qualified for state. “I am impressed with how well they did this year,” Foster-Ruckle said. “They’re learning a lot. We had a large variety and the kids put in a lot of time.” Some of them started working on their projects in September. The team of Brinly Bancroft, Preston Keating and Kamri Naff, with a score of 87 points in Life Event Planning; Jaydin Clounch, with 89.67 points, and the team of Jayda Showalter and Alexis Ogle with 86.33 points for their Helping Hands Service project; the team of Rylee Smith, Ava Teichgraeber and Cha’Kyra Walls with 85.66 points for their Focus on Children project; and the team of Ezekial Bridges and Kayleigh Watts with 97 points for their Chapter In Review. Since district, the students have taken time to tweak their projects, act on judges’ comments, improve their displays and practice their speeches. Smith, Teichgraeber and Walls’ community service project involved placing “buddy benches” at several schools in Chanute. Each team member told judges about selling their idea of Buddy Benches to school administrators, and then educating each school’s student body on how to use them. They closed their presentation by singing “You Got a friend in me” from the movie, Toy Story. “They told us we needed to be a little more confident when we sang,” Teichgraeber said. “We were kind of nervous,” Walls added. “The day before (we) were rehearsing and rehearsing our speech,” Smith said. Though they did really well, according to the judges, the girls have been revising their speeches, adding some items to their display and really looking forward to staying in a hotel and going to a dance when they go to state. The Life Event program on Teen Dating Violence was planned and carried out by Bancroft, Keating and Naff. They took turns giving their speech about the project goals, costs, planning and fundraising for the guest speaker who spoke at the high school. The trio has finished reorganizing their project has been at work on their speeches. “I think we’ll do pretty well,” Keating said. The Helping Hands Service project involved collecting hygiene products for students who are moved to Chanute through the foster care program. Three girls worked on the project, but decided to present the program to judges in different ways. Clounch worked on a display and gave a speech to judges about the project. Showalter and Ogle worked together and presented information about the program online. Both teams received comments about their speeches. Clounch said the judges told her to talk louder and look at them more, not her notecards. Talking louder and slowing down were comments that Showalter and Ogle have also been practicing for state. Judges also suggested memorizing the first and last sentence and looking up to speak. Watts and Bridges didn’t get a lot of feedback about their Chapter in Review project, which documents what the RMS FCCLA chapter did this school year. “I thought we might score high enough to go to state, but not as high as a 97,” Watts said. Besides comments about making eye contact, Bridges said they’re working on memorization. Watts said they’ve also coordinated their slide presentation to match what they are describing as they speak and they’ve improved the captions for their pictures, so they “encompass the idea of each slide,” she said. At state, the qualifications will be even tougher. The middle school students must do more than score 90 points for a gold medal; they must be the top gold medalist in their category to qualify for nationals. Mostly cloudy throughout the day and windy in the morning.